It is very important to install Lotus Notes 8.5, 9.0.1 version on the system to convert MSG file to NSF format. The software supports Windows 2000, 2003, 2008, XP, Vista, or Windows 7/8/8.1/10, 2008/2012 (32-bit & 64-bit) versions. MSG to NSF converter software allows transferring MSG files from Outlook into Lotus Notes. It will focus on safety as well as security during the whole conversion. However, the users just have to launch the application on the source machine. After that, choose the particular MSG file that will be converted to NSF file type. This conversion tool offers “Add Folder” option that permits the user to convert bulk MSG files to NSF. In simple words, if a user wants to migrate multiple messages then, select “Add Folder”. Afterward, mark all the items that the user wants to choose from a given list and convert all of them into Lotus Notes NSF file format. The MSG to NSF converter tool is capable to retain the folder hierarchy while accessing the .msg data during the migration. With this utility, users will receive the same folder hierarchy as it is even after the conversion process. Moreover, it keeps all data secure without any complication and allows the user to view .msg data in Lotus Notes. Export Outlook messages to NSF of any type & size. This software will provide a useful “Date Filter” option that helps to move MSG file to Lotus Notes. According to this feature, users permit to carry out a selective migration of MSG file. In this condition, users only require a date column “From” or “To” that they wish to filter. After doing this, all emails fall under a certain value will appear and users can easily convert MSG file to NSF. Lotus Notes 8.5 or 9.0.1 installation is necessary for performing the data conversion. Before Export, this tool will ask for a password. This advanced feature is added to MSG to NSF Migrator interface to assure the safety of the data. In addition, a summary report is generated in .csv format and then, save that file in the desirable location for future use. Free Demo Version of Outlook MSG to NSF Converter Tool Supports to Export Only 25 MSG Files/Folder. Explain the working of MSG to NSF Converter Tool? Step 1: Install & run Outlook MSG File to NSF Converter Tool. Step 2: Click on Add Folder to add multiple Outlook messages by browsing the folder from your system. Step 3: After adding the folder, the name of the folder will be displayed. Step 4: Apple Date-based filters and mark Maintain Folder Hierarchy option. 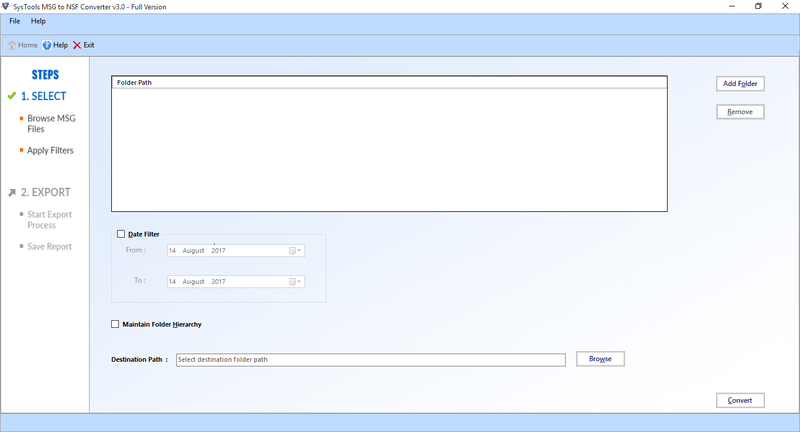 Step 5: Browse to the destination location to save the output Lotus Notes NSF file. Step 6: Click on Convert button. The process will start and the software will show the status of data items that are converted. Is Lotus Notes installation mandatory for exporting MSG file to NSF format? Yes, Of Course, installation of Lotus Notes mail client is required to convert Outlook MSG to Lotus Notes NSF file. 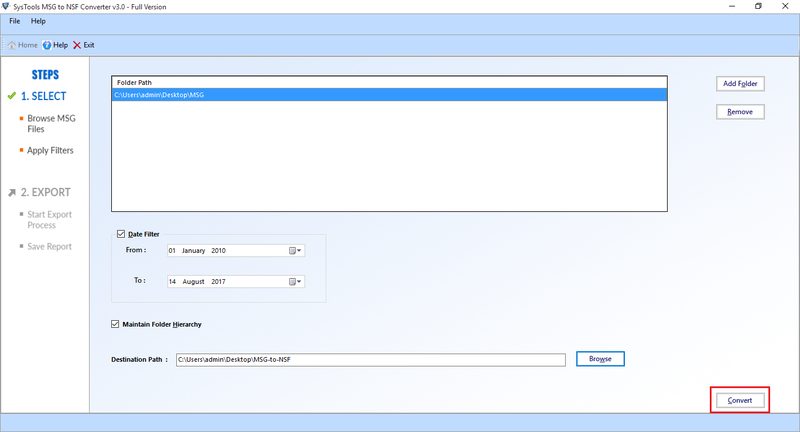 Will this MSG to NSF Migrator tool migrate all Outlook MSG files of a specific date range? Yes, our software provides "Date Filter" feature which enables the user to select those email messages (MSG) that fall within a certain date range. Does the software preserve the folder hierarchy while converting MSG file in Lotus Notes? Yes, the MSG file to NSF Exporter tool is able to maintain the internal structure throughout the entire conversion process. Also, users can easily open and view .msg file to Lotus Notes application. Can I save the exported final report to any desired location with the help of this Migration tool? 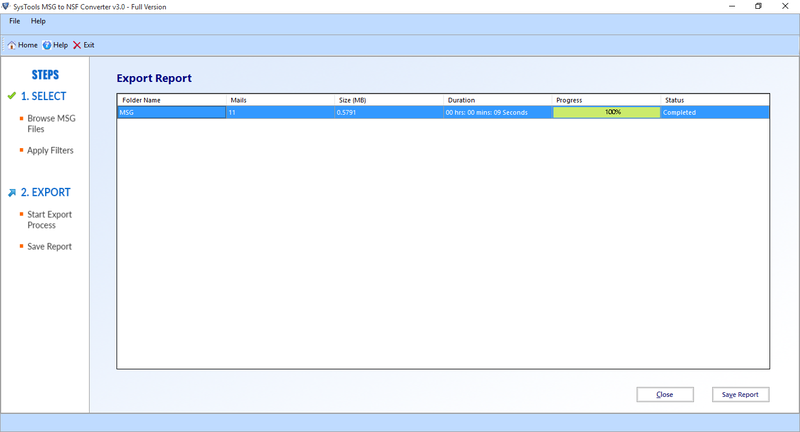 Yes, MSG to NSF converter tool is able to save a summary final report in the preferred location without any data loss. "I would like to thank Software development team for creating MSG to NSF Converter software, which is extremely user-friendly and easy to use. One of the best part I really liked this utility is that it allows me to transfer multiple Outlook .msg to .nsf file format in bulk at once without any data loss. Along with this, Date Filter is also very nice feature. Thanks a lot!!" "Outlook MSG to Lotus Notes NSF Exporter is the best conversion tool that I have ever tried. It is an amazing utility that helps to perform the data migration in an efficient and simplified way. However, this software is having fast performance and also it brings lots of attractive features as well. Great effort was done by a development team." "I have a large number Outlook messages in MSG file format that I need to move to Lotus Notes. It was impossible for me to complete that task for a bulk number of emails. Then, NSG to NSF Converter helps me a lot to convert MSG file to NSF file format. I must say that the tool is really effective. " "I am impressed with the simple user interface of MSG file to NSF Exporter tool. It was really difficult for me to think about the conversion process. Then, one of my friends suggested me FreeViewer MSG to Lotus Notes NSF Converter tool. I am amazed by this tool. I was able to complete my conversion process in just a few minutes without any data loss. Thanks!!"